Even crooked and bent | Where Did You Find God Today? A wonderful lady has recently begun to worship at my church. You can see the Holy Spirit in her face. She always smiles, is eager to greet people, and is pleasant and insightful in conversations. Yesterday, I sat a few rows behind her. During a praise song, she lifted her hand high. 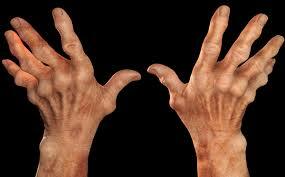 I noticed how crippled, crooked and misshapen with the arthritis her fingers were. And yet, she raised her hand high, unabashed, in worship to her Lord and Savior. The image pierced my heart. We are all arthritic to some degree, are we not? It may not be in our bones, but in our spirits. Life has made us misshapen. We may feel we are no longer in God’s image. We are bent, out of whack and feel deformed by the pressure of our experiences and attitudes. At times, we might want to hide from the world rather than reveal our true selves. We may long to be made right again, and feel bitterness because it isn’t happening. May we all take a lesson from this worshiping woman. She is not angry over her affliction and crying out, “Why me, Lord?” Her attitude isn’t one of shame and frustration. She takes what she has, what she is, and what she has become, and offers it up anyway– all the while praising her Lord. And I believe God smiles. I know He doesn’t only see twisted, swollen-jointed fingers. God peers down upon His child who basks in His love and is grateful He came into her life. While one transformation has happened to her hands, a better one has occurred, and continues to manifest inside her. Her pathways are being made straight even if time and age has bent her hands. Being honored to witness this beautiful event has transformed me, and I dare say straightened me out a bit, as well. Lord, let me lift myself to you as I am, with all my faults, my failures, my doubts, my fears. You accept me as I am, but graciously mold me to become what Your will desires. I cannot change many of the outside things in my life, but I can be transformed inside by Your merciful grace For that, I can lift my hands and praise You Jesus my Savoir. Thank you for showing me a truth about You through this lovely lady You brought into my midst. To Your Honor and Glory, Amen. Like you, I’m praising God today, because He sees me as He knows I will become in that Day! Would that we could all look at one another with His eyes…then the petty things of this world would fall away and we would learn to truly love our brothers and sisters in Christ by loving Christ more and more. We have a dear friend being operated on this morning to remove brain tumors. I thought how grateful I am for drugs that numb her pain during this procedure. My thoughts zoomed to the cross…there were no drugs for Christ’s pain. The actual physical pain of crucifixion, the emotional pain and shame of hanging there exposed, rejected. The pain of the weight of all our sins, the pain of separation from the Father, while He watched the holy blood drain from His body, down the jagged wood, into puddles on the ground. Just for me. Just for you. Lord, help me love people like You love people. And teach me to love and praise You more each day with my gnarled and crooked heart, like this dear woman does with her gnarled and crooked hands! Beautiful post and so true. I love it! Actually in recent months I have had trouble with tendonitis in my right shoulder. Raising my arm all the way up is a problem, so I have been giving lopsided benedictions. Not to worry, of course; God is blessing them anyway. your message is so well given and has touched my heart as she did your heart.